It’s beginning to look a lot like Christmas over here! And I’m delighted to kick off this holiday season with my 3rd annual Home for the Holidays Blog Tour. If you aren’t familiar with a blog tour – or hop – it’s like a virtual progressive dinner, but can be done with anything… food, decor, crafts, you name it! There are 30 blogs in all participating and you will see inside each of their homes/blogs. There will be 6 featured sites each day with a different topic every day. Read on to the end to see where we’ll be going each day! 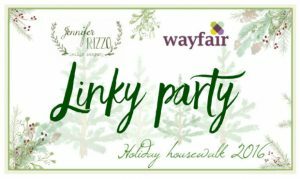 By the way, I am also linking up over at Jennifer Rizzo’s annual Holiday Housewalk 2016! Jen does her tour every year, too, and it is WAY bigger than mine. *smile* By linking my mantel design to her page, I have a chance to be selected for her next year’s tour! Be sure to visit her Holiday Housewalk… it is fabulous! Let it snow, let it snow, LET IT SNOW! In the south, we have endured one of the driest summers and falls on record, with record-breaking temps as well. I’ve been longing for cooler weather for months now, with visions of snowflakes dancing in my head! 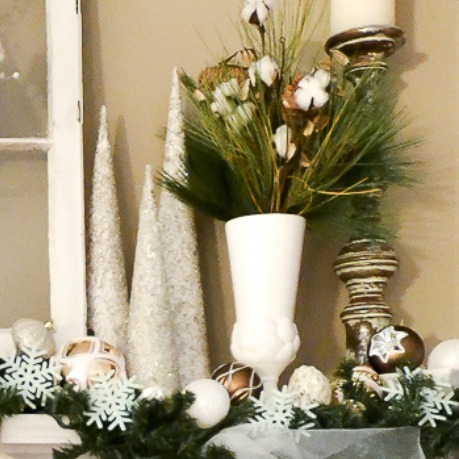 This winter White Christmas mantel satisfies that longing, in part! 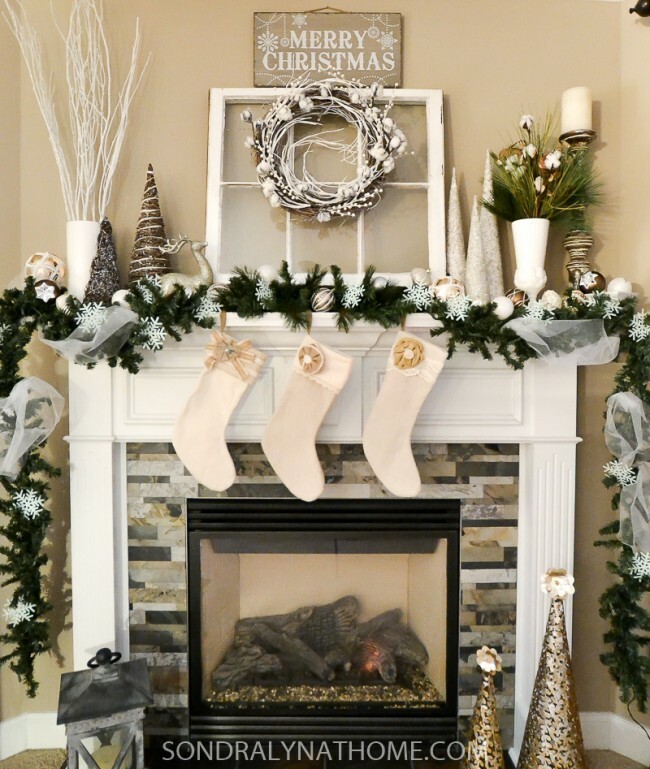 I am so excited to decorate this year’s mantel, after the recent update to our fireplace! 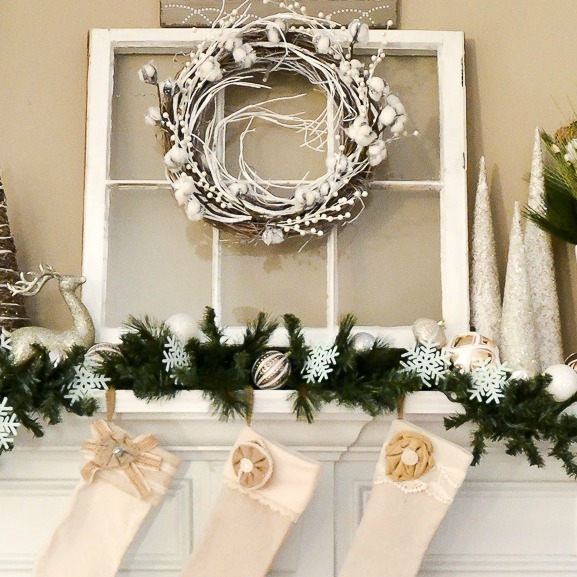 Anchoring this year’s mantel is a vintage window with 6 panes. I just love the sentiment of looking into someone’s home and seeing happy holiday decorations. Atop the window hangs a wreath that I put together with a grapevine wreath, a twiggy white garland and some cotton sprigs. To the right of the window, I used my Glass Bead Trees that I made a few years ago. I still love them! And I put a sprig of cotton and some greenery in a whitewear vase. On the left side are some prelit grapevine trees and a tall vase filled with some white branches. I draped a couple of prelit garland strands along the mantel. I love fresh greenery, but this is what I had on hand. It’s proof that you can use artificial greenery and botanicals and they can look very lovely. Filling in are some ornaments of varying sizes with touches of white and snowflake ornaments. 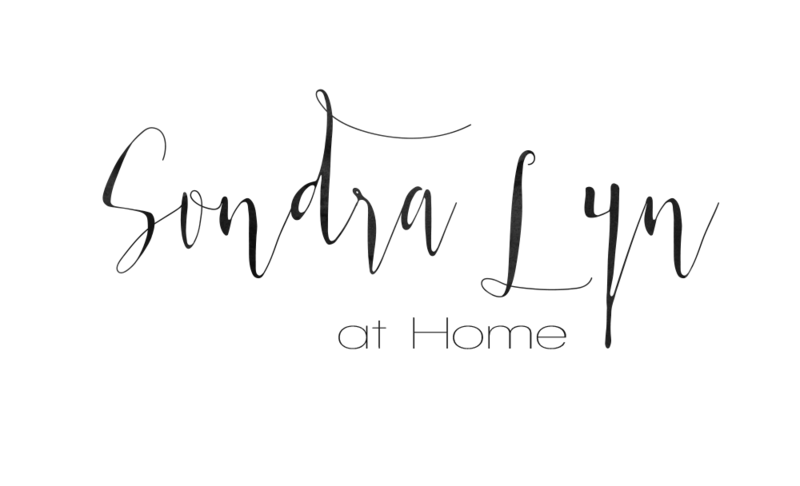 It is with much excitement that I present the 3rd annual Home for the Holidays blog tour sponsored by Sondra Lyn at Home! Beautiful! 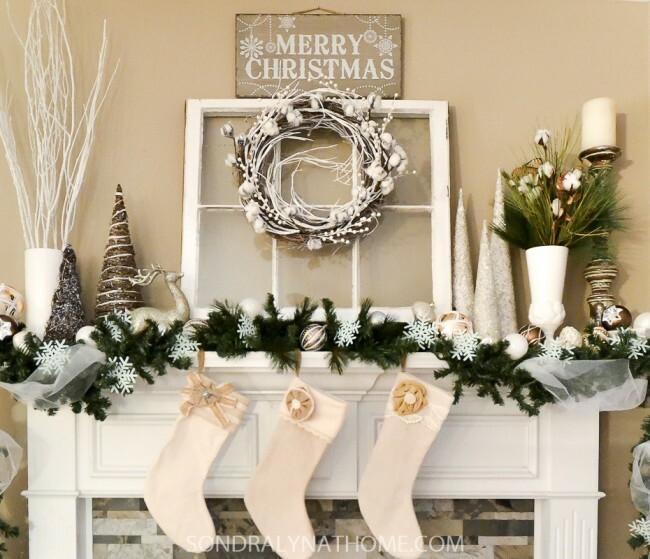 I love your fireplace makeover and your beautiful white Christmas mantel! Sondra, thank you so much for putting on the Home for the Holidays blog tour. I enjoy all the creativity and get inspired very year. 🙂 You mantel looks so cozy and warm. Maybe it’s the cotton! 😀 Great minds! Hugs to you and your family this holiday season. Your white mantel is beautiful, I love all the details. I also love your fireplace makeover. Thank you for this inspirational blog tour and for including me. 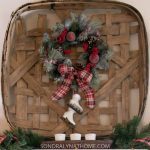 Love your white Christmas mantel… it turned out gorgeous! First of all, your mantel makeover looks wonderful. I love the updated look! Winter White is a lovely theme for Christmas and it turned out just gorgeous. I’d be tempted to keep most of your decor up for January and February. Thanks so much for hosting the blog tour! Sondra Lynn! What a geat improvement on your fireplace!!!! LOVE the surround. And it’s the perfect backdrop for an all winter white mantel. Just stunning! I think I’ll try a white mantel. Looks so Christmassy! Oh my Sondra just lovely and the mantel makeover too. I love it almost looks simple with just the white, but so much to make it elegant. I love using windows too. 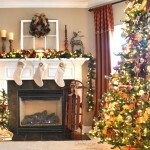 I am sure you are loving decorating your ‘new’ fireplace area this christmas. your winter white mantelscape is just perfect. Thanks for including me on the tour again this year. Happy holidays to you and your family Sondra Lynn! Hi Sondra Lyn, I do love the inviting warmth of your mantel.And having that window frame there is like having a view into a different space. And I think I need to take a peek at how you made those glass bead trees. I could really use them this year. Thanks for organizing this fantastic ‘hop’. Sondra, your mantel is gorgeous! I always love the mix of snow-whites and greenery at Christmastime, and you have done this to perfection! Your new stone surround is beautiful, too – your mantel decor really shows it off. Your mantel looks beautiful, Sondra! I’m loving the new tile that you added too. 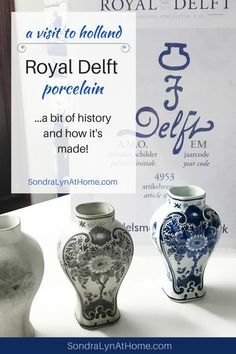 I love the tile and would have never guessed it was peel and stick! 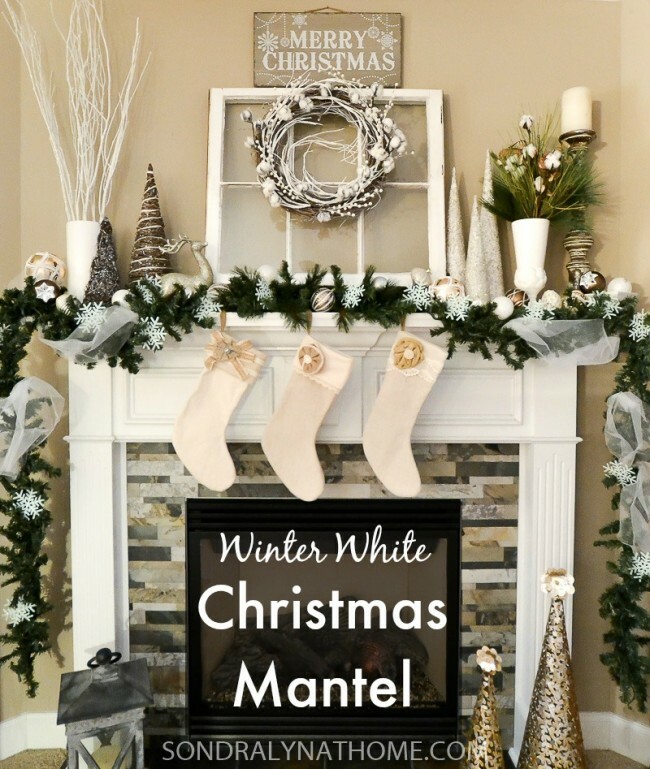 Your winter white Christmas mantle is gorgeous. The wreath is so pretty and the sprigs of cotton remind me of my grandpa’s farm when I was a little girl. Your decor is always beautiful and inspiring. I’m so thankful for the rain too! Can you hear the thunderous applause? Your mantel is so pretty and elegant. And I really love the peel and stick tile. That’s on my wish list now! Thanks for organizing the tour! Absolutely charming! Your family must adore coming to your home over the holidays!! I am loving this fireplace mantel. I think I need to step up my fireplace decorating game. 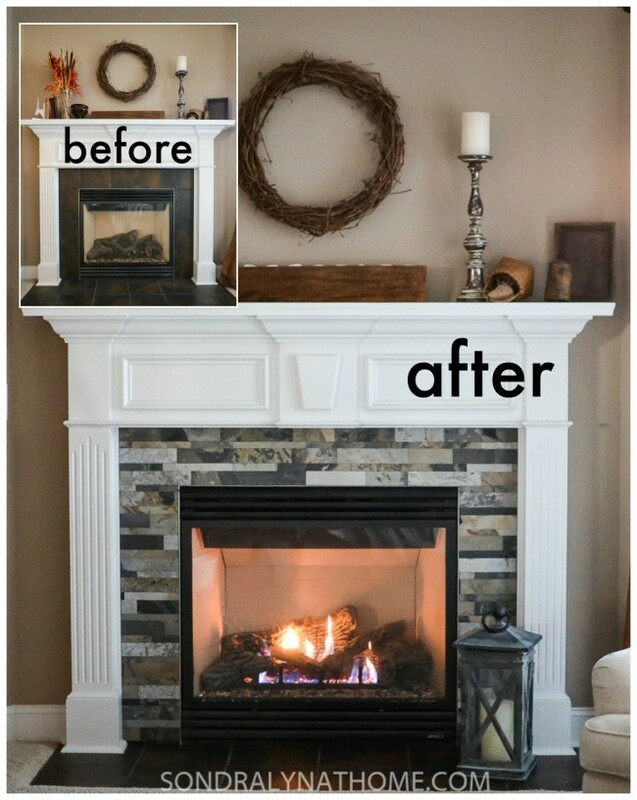 Sondra Lyn – we are in love with the new look of your fireplace. Your winter white theme is just perfection. We too are in the South and thrilled to have finally had some rain and cooler weather 🙂 Thank you so very much for including us in this fabulous hop! We greatly appreciate you.